You probably wouldn’t expect to see a lighthouse in Manhattan. 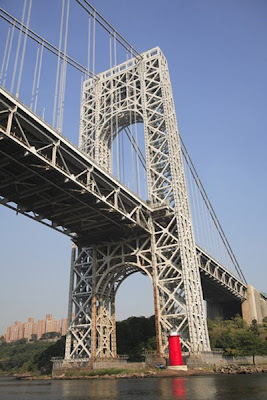 Located underneath the George Washington Bridge overlooking the Hudson River is the Little Red Lighthouse. A historic and literary landmark it was made famous by the children’s book The Little Red Lighthouse and the Great Gray Bridge. Officially it is called the Jeffrey's Hook lighthouse. Erected in the 1880s it moved to its current site in 1921. The lighthouse is located in Washington Heights and open for tours from the spring to fall. To reach it take the A train to 181 Street. Walk west on 181st street toward the Hudson River to Fort Washington Park. Walk over the pedestrian bridge and follow the path into the park. Wendy! What's happenin'? How the hell are ya? I love this lighthouse. Being a former New Yorker I have seen this before and am always amazed by the strangeness of it. Ahhhhh - New York! City or State, it's alll good! Oh! No you are right, I would not have expected that! I just stumbled across your blog. Just reading the names of all those destinations, and having peeked at some pictures tells me that I'll be back for my fill. That's a cute and unexpected New York monument! I had no idea there was a lighthouse on Manhattan. I want to visit!! Hi Catherine, Indeed it's all good. Kristine, Anne, Fly Girl and Erica, doesn't it look like it belongs in New England? Kavita, Glad you stopped by. Come back any time. I always look for this lighthouse when we circle Manhattan on the Circle Line tour with friends and family. I should buy the book for my grandson.